Recently a Python developer friend with whom I was pair programming with suggested that I show him how to write a little Ruby. I responded by telling him to check out Ruby Koans as a starting point. 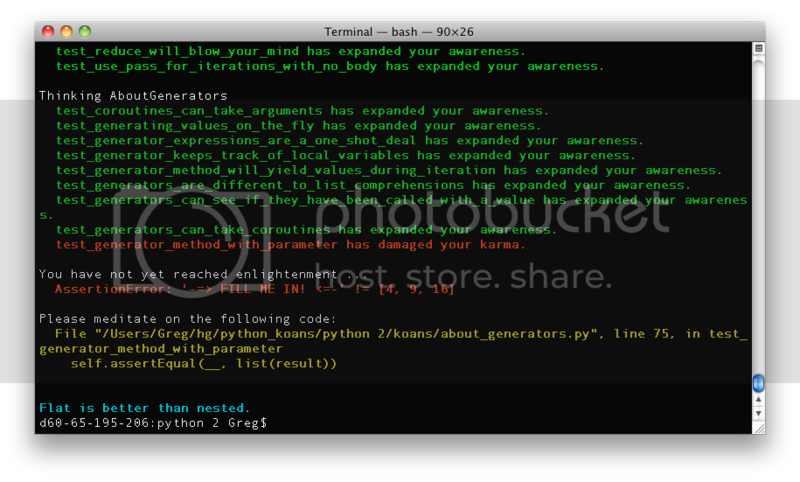 So, a few weeks later Python Koans is now complete and ready for action! Converting it was fairly easy. Aside from the differing philosophical approaches behind the two languages, Ruby and Python are fairly similar. We had to come up with completely new material for a few subjects like multiple inheritance and decorators, but for most features in Ruby there is something roughly comparable in Python. I highly recommend writing tests (or koans) as a means to lean a new language or framework. I've learned a lot from doing this. Totally awesome. I was around when the original Python koans project started after a few of us local Pythonistas showed up for a CLERB (Cleveland Ruby Brigade) meeting about Ruby koans with @jimweirich. *Really* happy to see it take off! Oh, thank you for this. This has already helped me and I'm only on the about_none. enjoyed going through the python koans. I especially enjoyed the two projects. The learning curve on the final project is a bit steep though, it took me 10 or 20 times longer than any other puzzle. Thanks!